What are "cookies" and how do I enable them in order to book ferry tickets online from this web site? How do I allow popups for Danae and why this is necessary? 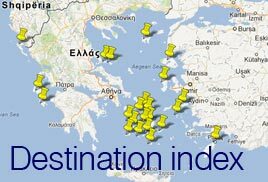 What Ports are there near to Athens? Greek ferry ticket delivery options and their particularities. How many persons is the maximum that can be booked into one taxi? I have booked a transfer but cannot find the driver at the pick up point. What should I do? I have booked a transfer starting from the airport or port but my plane / ferry has a delay and will not be there at the given time. Should I inform you and how? In order to be able to pay your purchased services, pop up window activity must be allowed for danae on your internet browser. PIRAEUS PORT is the country’s biggest port and one of the biggest in Europe. For most ferries serving the Islands this is their port of departure. By taxi: 30-45 minutes depending on the traffic. By electric railway (ISAP). Take the green line (1) direction Piraeus. Click on the link to find all the details. Piraeus Port is the south terminal station and the port is right in front of you as you go out from the station. You cannot miss it. NOTE: Stations between Monastiraki and Attiki do not operate. By Metro. Take the red (2) or blue line (3) and then change to electric railway green line (1) direction Piraeus. Click here to see a map with all the metro connections. No. 049: Omonia Square - Piraeus. Get off at "Akti Miaouli" stop. The port is very close. By metro. Take the blue line (3) from the Athens International Airport and change at Monastiraki station to Metro line (1) direction Piraeus. Estimated journey time is 60 minutes. Click on the link to find all the details. Piraeus Port is the south terminal station and the port is right in front of you as you go out from the station. You cannot miss it. By suburban railway (Proastiakos). 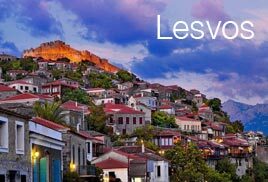 Take direction Neratziotissa and change to electric railway (ISAP) green line (1) direction Piraeus. By regional bus (KTEL Attikis). Take the bus from the station of Rafina just outside the port, which will drop you off at the Athens terminal station of Mavromateon Street. Walk to Victoria square which is two blocks away (see map) and take the electric railway (ISAP) green line (1) direction Piraeus. Click on the link to find all the details. Piraeus Port is the south terminal station and the port is right in front of you as you go out from the station. You cannot miss it. 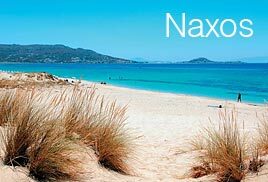 RAFINA PORT is on the NE part of Athens further away from the city centre but quite closer to the airport. 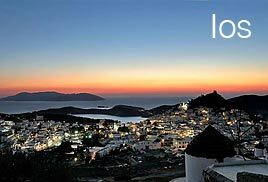 It is a smaller port mainly serving the northern part of the Cyclades island complex. 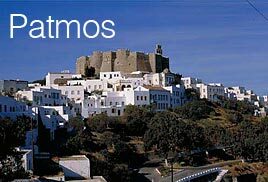 Its main advantage is its proximity to the airport and also that it is closer to some popular islands like Mykonos. By regional bus (KTEL Attikis). Take the bus from Pedion Areos at Mavromateon Street. By regional bus (KTEL Attikis). The line departs from the Arrivals Level, opposite the Sofitel Hotel. LAVRIO PORT is on the Eastern part of Athens quite far from the city centre and the airport. It is a secondary port serving very few routes at the moment. 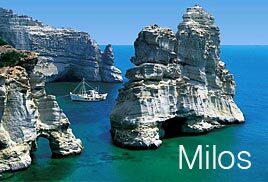 Its advantage is that it is quite closer to the islands than Piraeus. By regional bus (KTEL Attikis). The line departs from the Arrivals Level, opposite the Sofitel Hotel. Change bus at Markopoulo. 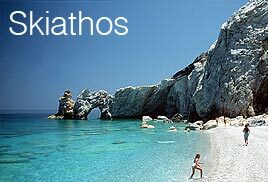 AGIOS KONSTANTINOS PORT is located in the North Euboean gulf in the center of Greece on the East coast of the mainland serving mostly the Northern Sporades island complex, which includes the islands of Skopelos, Alonissos, Skiathos and a few other smaller ones. By car it will take you around 2 1/2 hours. The distance is 170 Km (107 miles). 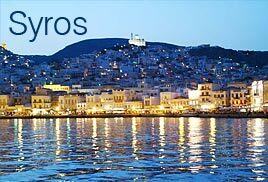 VOLOS PORT is also located in the center of Greece on the East cost of the mainland further North from Agios Konstantinos also serving mostly the Northern Sporades island complex, which includes the islands of Skopelos, Alonissos, Skiathos and a few other smaller ones. By car it will take you around 4 hours. The distance is 320 Km (200 miles). By train from Larissa Station, which is the main Athens train Station. Click here for map. THESSALONIKI PORT is the country’s second biggest city and is located in the Northern part of Greece. There are very few ferry schedules to the islands from here and usually only in summertime. There are some connections to the Northern Sporades, one crossing the whole Aegean Sea all the way to Crete, and some to the North Eastern islands of Greece. By car it will take you a between 5 and 6 hours. The distance is 515 Km (325 miles). By plane. 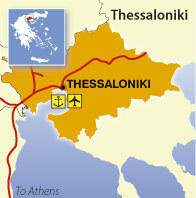 There is an international airport at Thessaloniki. PATRA PORT is located on the West coast of Greece on the far North Eastern corner of Peloponissos. This port serves the Ionian Sea, which includes the islands of Corfu, Ithaca, Lefkada, Kefallonia, Zakynthos and a few more and the connections between Greece and Italy. By car it will take you around 3 hours. The distance is 220 Km (140 miles). Some shipping companies operating international routes provide transportation services between Athens – Patras and Igoumenitsa. Our staff will help you. By train from Peloponissos Station, which is right behind the main Athens train station (Larissa station). Click here for details. 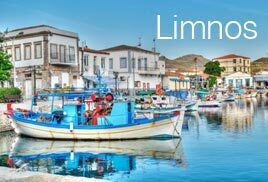 KYLLINI PORT is a small port on the west cost of Greece near Patras. 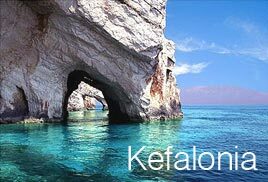 It serves a few schedules to Kefallonia and Zakynthos. By car it will take you a between 3 and 4 hours. The distance is 300 Km (190 miles). 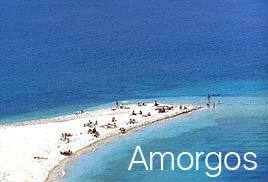 IGOUMENITSA PORT is located further north on the west cost of Greece and it belongs to the Prefecture of Thesprotia. 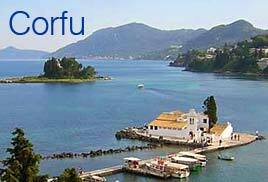 It serves some connections between Greece and Italy and some to the island of Corfu mainly. By car it will take you around 5 to 6 hours. The distance is 470 Km (295 miles). 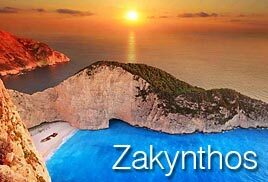 Are there electronic tickets (e-tickets) for ferries in Greece? No, unfortunately there aren’t. A ticket has to be printed and you need to have the original with you. Are there special fares for children? Note: Children under the age of 15 are not allowed to travel unescorted. When travelling from/to Italy, the policy of shipping companies as far as age is concerned differs. You can see an overview at our International bookings page. Are there special fares for students? Only Greek students are entitled to a discount on domestic ferries. To have a discount, you need to have a valid Greek student identity card. When travelling from/to Italy, some companies offer a discount to passengers – holders of ISIC and Youth Cards. Is it cheaper to buy return tickets rather than one-way tickets? When travelling within Greece usually not. Some shipping companies though offer a discount for return tickets during some days and/or periods. 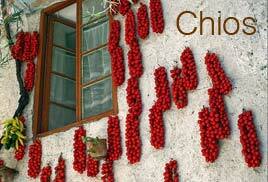 When travelling from/to Italy, most companies offer special discounts including some for return trips. Our staff will inform you further. We are a group of travellers. Are we entitled to a discount? There must be 20 passengers and over in order to be considered a groups and take advantage of group discounts. Please contact our staff for details. I am travelling with a camper / caravan. Is there a special offer for me? Some shipping companies operating routes between Greece and Italy, for certain time periods (usually between the beginning of April and the end of October) offer the possibility for campers to travel, with the purchase of a deck + vehicle ticket, staying in their camper using the ferry’s facilities (showers, toilets, power outlets, etc). I am travelling with a Eurail / Interail / etc pass. Am I entitled to a ferry discount? Some shipping companies (Minoan Lines, Superfast, etc) operating routes between Greece and Italy offer travellers with such a pass special discounts. Please contact our staff for further details. What types of Vessels are there? These vessels can be divided into two categories: the old ones and the modern ones. The main differences between them are their cruising speed, the quality of accommodation and services provided and the prices. They are usually very big vessels, which also carry vehicles. Their advantages compared to the High Speed vessels, like the catamarans, are that they are more seaworthy, offer more “relaxed” accommodation and cabins and the passengers have the possibility to sit outside and enjoy their cruise across the Greek islands. These vessels are smaller and much faster than conventional ones. Only a few of them can carry vehicles. Their main advantage is that they go twice as fast. Passengers are usually not allowed to sit outside even though there is some space on some of them. The accommodation inside is a little like a very wide airplane. The better the class, the wider the seat. There are no cabins. Do all ferries offer different classes of service and accommodation? Business class: Less crowded, cleaner and more comfortable. There are only non-smoking areas. On long trips with conventional old vessels we definitely suggest it. Economy class air seats: Airplane type seats, numbered. Non-smoking area only. Crowded but organized. Economy simple / Deck: 'Cafeteria' and/or 'lounge' type areas, very crowded. Non-smoking areas only. Luxury cabins with window and private toilet (outside cabins). A' class outside cabins with window and private toilet (outside cabins). AB' class inside cabins without window, with private toilet (inside cabins). B' class cabins without window, without private toilet (inside cabins). Are there smoking and non-smoking areas? As of July 2009, smoking is prohibited in any area inside any ship by law. When booking online, at the accommodation choosing page, different types are described in codes. What do these codes stand for? Below you will find a description for these codes. There are differences between each shipping company but the logic is the same. EC, ECS, ECT, ECTS Economy class seats / lounge. The T is for table. The S is for ex-smoking areas. It does not apply any more but is still shown by some shipping companies. B, BS, BT, BTS BUS, DKN, A’ class Business class seats / lounge. The T is for table. The S is for ex-smoking areas. It does not apply any more but is still shown by some shipping companies. VIP, VIPS, VIPT, VIPTS VIP class. The T is for table. The S is for ex-smoking areas. It does not apply any more but is still shown by some shipping companies. How are seats assigned when booking online? Can I sit next to my companion? When making a reservation through the Internet, the central reservations system assigns automatically the seats. Seats are in most cases adjacent provided there is availability. There are some shipping companies whose online reservations system does not allow seat assignment. In those cases, there is no way to secure adjacent seats. Nevertheless, it is very common that seats are swapped during boarding time so that passengers can sit beside their companions. At what point is my ferry reservation finalized & confirmed? When you finish all the steps of the online ferry booking application and after the bank, you will receive a confirmation message and a confirmation email which will include your reservation and detailed information concerning your booking. This can also be verified by logging in and checking your booking by clicking on the “My orders” link. You cannot travel unless your booking is confirmed and you have the actual tickets in hand. You cannot claim tickets unless your reservation status is confirmed and the tickets paid for. Our office is located in the center of Athens, few meters away from Syntagma Square and the main metro station. A map can be found here. Syntagma Square is the main square of Athens where the Greek Parliament is also located. 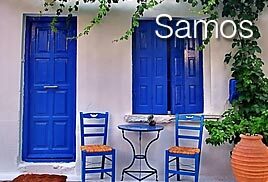 You can reach Syntagma by Metro, bus and taxis from both the airport and the Port of Piraeus. What are Danae Travel’ s opening hours? Our office is open Monday – Friday 09:00 – 17:00. We are closed on weekends and National holidays. A list of those dates can be found here. Do you have an office at the port where my ferry is departing from? Our office is NOT located at the port. It is located in the center of Athens. If you have chosen to pick up your tickets from our office, you cannot pick them up from anywhere else. Since there are no electronic tickets for ferries in Greece, please follow the instructions given when you choose a ticket delivery option through our website. Is your office near the Port? Our office in the center of Athens is not near the port. 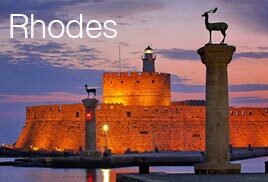 You need to take the Metro, the bus or a taxi in order to reach the ports of Athens (Piraeus, Rafina & Lavrio). Details you can find in this FAQ’ s port section. How long does it take to get from the Athens Airport to your office? Depending on traffic conditions it could take up to 90 minutes. Would be prudent to have at least 3 hours if you need to stop by our office before taking a ferry from Piraeus port. How long does it take to get to the Athens Ports from your office? To the port of Piraeus, 30-60 minutes. To the port of Rafina, 60-90 minutes. To the port of Lavrio, 90-120 minutes. These times are approximate and can change depending on traffic. Detailed information about the ports and how to reach them, you can find in this FAQ’ s port section. If my departure port is not one of the Athens Ports (Piraeus, Rafina & Lavrio) should I choose “Pick up from our office” as delivery option for my tickets? No you should not. Only choose this delivery option if you will spend some time in Athens and therefore have time to pick up your tickets from our office. If I have chosen “Pick up from our office” as delivery type and I miss to pick up my ferry tickets or any other travel document, can I pick them up from somewhere else? NO. If you have arranged to pick up your travel documents from our office you CANNOT pick them up from somewhere else. Since there are no electronic tickets for ferries in Greece, you need to have the actual ticket with you in order to board the ferry. You cannot board with a confirmation number or an email print out. Please make sure to visit our office during opening hours (Mo – Fri 09:00 – 17:00). If this is not possible please contact us early enough in order to arrange for a different delivery. For National holiday dates, please click here. If I miss to pick up my tickets at your office, am I entitled to a refund? No you are not. It is your responsibility not to miss picking up your tickets. If, in any case, you inform us by phone during our office opening hours and at least 2 hours prior to the ferry’s departure, of your inability to pick up your tickets from our office in time then we will contact the shipping company in question and try to cancel your reservation with the less possible damage for you. In no way does this constitute a guarantee of any refund. Please note that cancellations are subject to each shipping company’s policies. What can be done if I am at the port ready to board my ferry without my tickets because I failed / forgot to pick them up or misunderstood something about the procedure, and the ferry is about to leave? Nothing can be done since ferry tickets in Greece are unfortunately not electronic. This means that you will not be allowed to board the ferry without your paper tickets in hand. You will need to issue new tickets and inform us as soon as possible so that we try and cancel or change the ones already issued (possibility subject to each company’s terms & conditions). Please note that it is possible that there will be no time to do anything since the problem usually occurs few minutes before the departure of the ferry, after which no cancellations or changes are allowed. Also there are shipping companies, which do not allow cancellations or changes in less than two hours before the ferry departure time. If you try and issue new tickets but there is no availability, try to explain to the shipping company’s staff at their tickets counter that you have already issued tickets but do not have them. Usually nothing can be done and you will need to travel with the next available ferry, but I could be worth a try. Upon arrival at your office I am informed that my ferry schedule was cancelled or changed. Why was I not informed before? The shipping company is by law obliged to contact their clients in order to inform them of changes or cancellations. That is why we insist that you provide us with a valid contact number, so that we note it within your reservation making it available to the shipping company’s staff. Unfortunately many shipping companies fail to meet this obligation. We at Danae, as soon as we are informed of any changes or cancellations affecting our clients, try to immediately contact them first by email and then if there is no time by phone. If it happens though and you were not informed it is either because the contact details you sent us were not correct or because you were unreachable by email or phone. If you are on your way to Greece or already here, chances are that you will not have access to your email. Only by providing us with a valid phone number, working in Greece, we will be able to contact you if we are informed of any such change/cancellation. In case extra costs occur because of a ferry schedule cancellation or change, who is responsible to cover them? In no way can Danae Travel be held responsible for cancellations or changes made by shipping companies. All claims have to be addressed to the shipping company is question. Our staff will guide you through the procedure. Shipping company Terms & Conditions can be found here. Where at the Athens International Airport is the ticket pick up point located? Ferry tickets can be picked up from our cooperating agency, Aktina Travel,, at the arrivals level (click here for map) of the Athens International Airport which is open 24 hours daily. What will I need to have with me in order to pick up my tickets? Please give your envelope number (you can find it in your final confirmation email) and name to our cooperating agency’s staff. They will assist you with any additional information you might need. Why do I have to provide you with all this information concerning my arrival? Is it important? It is extremely important that we have accurate and updated information concerning your arrival at the Athens International Airport. We send thousands of tickets to the airport every summer. We will send your tickets to the airport one 1 to 3 working days before your arrival day therefore we need your arrival date. Having also your flight details allows us to track delays, etc. If the arrival details are not correct we cannot be held responsible for delivery problems. Do I have to inform you if my flight details change? In case your flight details change, please inform us by email or phone the soonest possible. If you miss to do so, we cannot be held responsible for delivery problems. Can I cancel or change my tickets at the airport? You cannot cancel nor change your tickets at the airport. The reason is that ferry tickets in Greece are not electronic and also that only the office which has issued the tickets can change or cancel them. Our cooperating agency cannot cancel or change tickets issued by us. They can only issue new tickets for you. During our opening hours, and providing that you do not have the possibility to come by our office in the centre of Athens, you can call us and we will help you with the easiest and less costly procedure in order to make the cancellation or change. In all cases it is very important that cancelled tickets are sent back to us. We cannot proceed to any refund unless we have the actual tickets. How long does it take to get to the Athens Ports from the airport? To the port of Piraeus, 60 - 90 minutes. To the port of Rafina, 30 - 60 minutes. 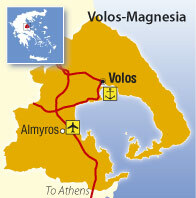 To the port of Lavrio, 60 - 90 minute. These times are approximate and can change depending on traffic. Detailed information about the ports and how to reach them, you can find here. Upon arrival at your cooperating agency at the airport I am informed that my ferry schedule was cancelled or changed. Why was I not informed before? Which courier service do you cooperate with? We cooperate with UPS for all international shipments. We have had an excellent cooperation with UPS for a number of years. In how many days will I receive my travel documents? All reservations through our website are processed in less than 24 hours. All international shipments are shipped on the next business day. As soon as we deliver your package to UPS and they process it, you will receive an email with a tracking number. You can then visit the UPS website, and enter your number in order to track your package. Does someone have to be at the delivery address in order to collect the shipment? Someone has to sign for the delivery. UPS will try several times to find someone at the given address. If you wish that the delivery takes place at a certain time or different address, please contact UPS is your country as soon as you receive your tracking number. If I have not received my shipment within these limits after receipt of my tracking number, what should I do? Contact UPS in your country and give them your tracking number. They will give you information concerning your shipment. If my shipment is lost, whose responsibility is it? All travel documents purchased from our agency and sent by courier service are made pursuant to a shipment contract. This means that the risk of loss and title for such items pass to you upon our delivery to the carrier. In case of loss of ferry tickets, shipping companies do not replace nor refund the tickets. UPS, nor any other carrier insures documents. Only packages can be insured. We cooperate with "Geniki Taxydromiki" for all domestic shipments. We have had a good cooperation with them for a number of years. In how long will I receive my travel documents? Shipments in Athens are delivered next business day. Shipments in other cities or islands in 2 business days. Someone has to sign for the delivery. The carrier will try several times to find someone at the given address. If I have not received my shipment within the given limits, what should I do? Contact us and we will provide you with a tracking number and the contact details of the carrier in your region. They will give you information concerning your shipment. What does Danae Travel do to guarantee that my tickets will be delivered to my hotel in time? We contact the hotel 3 days before the check-in date that our client has given us in order to verify the reservation. We deliver an envelope at the reception of the hotel with full details concerning you and your reservation in their establishment. We keep a name and a signature of the person at the reception accepting the envelope on your behalf and the exact date and time. We call them again to confirm receipt. Why do I have to provide you with so much information concerning my hotel reservation? Is it that important? It is imperative that you provide us with detailed and accurate information concerning your hotel booking. It is the only way we can prepare and follow the delivery of your travel documents. Should I inform you of any changes concerning my hotel booking? You should inform us the soonest possible. If you fail to do so, we cannot be held responsible for delivery problems. Why do you claim to deliver travel documents only to selected hotels? There are some hotels our clients have had problems with as far as travel document deliveries is concerned. When we have repeated incidents, we black list those hotels. This means that we might contact you and inform you of the problem. I just arrived at my hotel and at the hotel reception they tell me there is no delivery for me. What should I do? You should contact our office during opening hours or the emergency number found in your confirmation email. We always keep the name of the person at the hotel who signed for your delivery as well as the delivery date and time. See below the full process we follow. Why is there a different charge for the "Athens Hotel delivery" and "Courier within Athens" service? If I choose "courier within Athens" as delivery option can my tickets be delivered to my hotels address in Athens? When we deliver travel documents to a hotel we follow a quite complicated process (see above) in order to guarantee that the hotel reception person who will be the first recipient of the envelope under your name containing your travel documents will not loose it or misplace it. This process costs. When you choose "courier within Athens" your travel documents will be delivered to a private address directly to the recipient written on the envelope. This is not possible for a hotel. Do I have to hold my ferry tickets in order to board my ferry? Yes. Passengers need to hold printed tickets in order to board their ferry. Ferry tickets in Greece are not electronic. Passengers cannot board with just the booking number (PNR) or by showing the booking email confirmation. Where at the port can I pick up my ferry tickets? Your ferry tickets can be picked up from the ferry operator's offices, ticketing booths at the piers where available or its port agent (s) at the port. When you finalize your booking, you will be given detailed information about the location of each pick up point. What information do passengers need to have available in order to have their tickets printed? Passengers will need to provide their reservation number (PNR), their name and the ferry they travel with. All this information is found on the booking confirmation email sent by Danae. Some port agents also ask for an ID. Do I need to be at the port much earlier in order to pick up my tickets? Passengers should be at the port early enough as some port agents are not located next to the pier from which the ferry is departing. Please check their location via the link sent to you. There might also be queues. Popular ports are usually very busy during the summer. Port agent offices are usually travel agencies which are open throughout the day. Ticketing booths usually open one hour before the ferry departure. Can I pick up my tickets earlier or only on the day of my departure? You can pick up your tickets at any moment after your reservation is finalized. 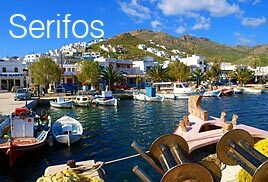 Especially on the islands, where the port is located next to the main town, it is quite certain that you will pass by a port agent during your stay. You can just walk in and have your tickets printed. Can I pick up ferry tickets for next crossings at my first departure port? Yes. Passengers, who have multiple legs with ferries, can pick up tickets for later crossings as well as long as the agent they visit is a port agent for the ferry operator they will travel with. On the link provided, we give a list of agents for every operator you have booked with, in every port. If I have chosen to pick up my ferry tickets at the port, can I still pass by Danae's office in central Athens and have my tickets printed? Yes you can. Check here our office location and opening hours. Can ferry operator port agents help me change or cancel tickets issued by Danae? Yes, as long as the agent they visit is a port agent for the ferry operator they will travel with and they wish to change or cancel. How long before the ferry’s departure do I need to be at the port? Foot passengers should be at the port at least 45 minutes (domestic trips) and 1 hour (international trips) prior to the departure. Note: Most departures take place between 07:00 and 08:30 every morning, which means that this is the busiest time at the ports. For international trips (e.g. Greece-Italy), please visit the respective shipping company's website as there may be special conditions in place according to the season and expected traffic. Can I buy my ticket inside the ferry? No, tickets have to be purchased before the departure. You need to have your ticket with you in order to board the ferry. During high season do not risk going to the port without having bought your ticket. Can I use the reservation number and/or the confirmation email you have sent me in order to board the ferry? No, you need to have a printed original ticket with you in order to board the ferry. My name was incorrectly written on my ticket. Will I be able to board? There is a legal requirement for the ferries to have a passengers' name list for safety reasons (E.U. Directive 98/41). Although most of the times there is no formal check-in process, names may be checked during boarding and you may not be allowed to board if they are not correct. Do I need an ID to board and travel by ferry in Greece? No passport nor ID is required in order to travel within Greece by ferry. You will need one using international lines traveling to/from Italy and Turkey. If my ferry is at the port, how much earlier than my departure time can I board? Usually boarding starts 2 hours before the departure time. You can as long as it is in its cage. In some ships, there are areas for pets where special cages exist for the needs of your pet. Also, you have to bring all the necessary medical papers. Can I take my bicycle on board? You can and there is no extra charge. How will I find my seat / cabin? What will I do with my luggage once onboard? You can either leave your luggage at the entrance on the special luggage shelves (not guarded) or take them with you to your seat / cabin. Do I have the possibility to upgrade my ticket or request a cabin paying an extra charge onboard? Yes you can by visiting the ferry’s reception onboard. It is not guaranteed though that there will be availability for the desired accommodation. I am handicapped, will I be able to board my ferry? Most ferries have elevators and you will have no problem boarding. Please inform our staff so as to help you. Once onboard, can I buy something to drink / eat? All Greek ferries gave at least a snack-bar. Bigger vessels operating long routes usually have restaurants. I have bought a deck ticket, can I go inside the ferry? Yes you can. There just will not be a seat available for you. You can of course all the economy class facilities (snack bars, toilets, etc). If the ferry is not full, you will also be aloud to sit in the economy lounge areas. Deck tickets concern only conventional ferries. I missed my ferry due to my late arrival at the port. What can I do? There is nothing to be done after the departure of the ferry. You will need to buy new tickets for the next available one. Since you are at the port already, the easiest way is to immediately go to the shipping company’s booth / office at the port. My ferry has not yet departed but I will not make it to the port on time. What can I do? Contact our office or the shipping company in question the soonest possible. If you are at the port, visit the shipping company’s office there. The earlier we or the shipping company are contacted the better it is. Cancellations or changes are subject to each shipping company’s policy. Details can be found within the “Terms & Conditions” section. Please note that most shipping companies do not allow cancellations nor changes in less than two (2) hours prior to the departure time. What happens if I miss my connection due to a late arrival of my ferry? If a different ferry company than the one being late operated the ferry that you missed, for them it is considered your responsibility and they will not allow a refund. As soon as you realize that you will not arrive on time follow what is said in the previous paragraph. A claim could be filed against the shipping company responsible for the delay. As soon as you realize that you will not arrive on time follow what is said in the previous paragraph. In no way can Danae Travel be held responsible for ferry delays and extra costs occurring from this fact. I lost my ferry ticket. What can I do? Unfortunately in every case you will need to purchase a new ticket without having any guarantee concerning availability. As soon as you realize you have lost your ticket, contact the shipping company or our office. Some shipping companies suggest that passengers who have lost their ticket(s) and have bought a new ticket with one of their ferries must declare in writing the loss, either directly to the shipping company or through their agent who issued the ticket(s), indicating the departure date, itinerary, reservation number and ticket number as well as the number of the new ticket bought. This declaration should be accompanied by a photocopy of the new ticket issued. If the ticket has not been found used within a predefined period of time, the company shall grant a ticket free of charge of the same value of the one lost. Details can be found in each shipping company’s "Terms & Conditions" section. I have reserved my ferry tickets through Danae Travel. How will I be informed of any schedule changes? If it happens though and you are not informed it is either because the contact details you sent us were not correct or because you were unreachable by email or phone. If you are on your way to Greece or already here, chances are that you will not have access to your email. Only by providing us with a valid phone number, working in Greece, we will be able to contact you if we are informed of any such change/cancellation. Our suggestion is that you contact the shipping company you are traveling with the day before your departure in order to confirm. When at the airport, the driver will meet you outside the baggage claim/customs exit inside the arrivals hall. When at a port, the driver will be expecting you outside your ferry. In case you have booked a coach, as it may have to park in a specially designated parking area, the driver will meet you as above and you may have to walk to the vehicle. In all cases, the driver will be carrying a sign with the name you designated in your order as the ‘Pickup Name’ on it. As a general rule, taxis can take up to 3 Adults, 1 child and three pieces of normal sized luggage. When you are booking online, the system will automatically offer you the appropriate vehicle. If you have any questions, please contact us and we will help you with the reservation. A driver may refuse to carry a party if he/she feels the number of persons exceeds his/her vehicle’s maximum safety limits. You can contact our office and, if outside office hours, there is an emergency telephone number on your transfer voucher. If you have booked a taxi and your pick up point is at the airport you can also go to our cooperating office, Aktina Travel, for assistance. Click here for details. Please note that Athens ports can be very busy during high season, which means that the driver might not be able to drive the vehicle just outside the vessel. It is better to wait just outside the ferry and contact us. You must contact our office and, if outside office hours, call our emergency telephone number on your transfer voucher. Please use it to inform us of your delay as soon as you know about it. If your delay is more that 60 minutes and you have not informed us then we cannot guarantee that the driver will still be there waiting for you and will have no responsibility concerning your missed transfer.